I was in the 8th grade when Adolf Eichmann went on trial in Jerusalem after the Israeli government's successful operation to locate him in Argentina and secretly abduct him to stand trial in Israel. I was already in high school a year later when he was finally executed. I can well remember all that happening and that it was considered important, but I doubt I reflected more deeply about those events until later when I read Hannah Arendt's famous (and somewhat controversial analysis) of Eichmann and of his trial, Eichmann in Jerusalem: A Report on the Banality of Evil. 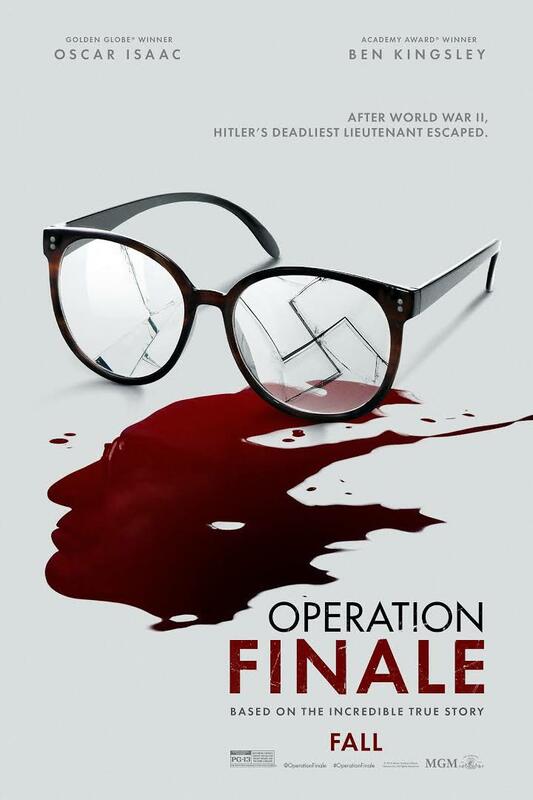 The story is a familiar one, of course, an illustration of Israeli effectiveness at accomplishing what few others seemed interested in (although the German Eichmann-hunter, Fritz Bauer, is given a cameo in the movie). The film tries hard to create suspense, and indeed many things did go wrong that imperiled the mission, but again we all know how the story ended, so suspense is ultimately lacking. More effectively the film focuses in particular on one member of the Mossad Team, Peter Malkin (Oscar Isaac), in effect telling the story through his interactions with Eichmann (Ben Kingsley) and the ghosts in his own haunted memory of the Final Solution. Like those TV documentaries that have tried to dramatize the hunt for Eichmann and his successful abduction and extraction for Argentina, the movie mainly illuminates the bizarre experience that Eichmann's captors had to endure, cooped up with him for days on end, essentially staring evil directly in the face. In the process, while Kingsley does a great job giving some sort of personality to the character he plays, in the end one is left with yet another illustration of what Arendt so famously - and fittingly -termed "the banality of evil." In 1960, the war was, of course, still a recent memory. (I can remember being in Vienna just a decade later and having lunch there with someone from that generation who was still arguing the case that the West should have sided with the Reich against Russia.) So, historically speaking, we are not surprised at the horrifying evocation of the Nazi movement's continued survival and ideological resonance in the conservative Argentinian ambience. At the time, the world would have dismissed most of them largely as losers who would not accept the verdict of defeat. Some 60 years later, they seem almost totemic figures, symbolizing a perennial type of hatred that seems successfully to resist final defeat. In this terrible time of testing for the Church, when opposing factions within the Church are going after each other with even more than the usual ferocity, the Church today recalls the life of one of her greatest saints, Saint Augustine of Hippo (354-430), one of the four great Doctors of the Latin Church, along with Saint Ambrose, Saint jerome, and Saint Gregory the Great. Augustine's greatest boast was that he praised the grace of God, and he is rightly referred to as the Doctor gratiae, the Doctor of Grace. His teaching on grace is reflected in the words - literally lifted from Augustine's writing - which we will pray shortly in the Preface of the Saints, in crowning their [the saints'] merits, you [God] crown your own gifts. Augustine is one of those few saints whom modern non-Christian thinkers might still take somewhat seriously. Unlike later, medieval Doctors of the Church, Augustine, lived, ministered as a Bishop, and wrote in a world in which the Christian faith and the Church were not not yet quite the unchallenged options, a time when paganism, while definitely in decline, still posed a challenging alternative. Augustine's encounter with all the major philosophical and religious options on offer in his time highlights his continued relevance in our pluralistic world in which Christian faith and the Church are no longer the only or obvious alternatives for those searching for meaningful answers and a fulfilling way of life. At this particular juncture in our history, however, in this terrible time when opposing factions within the Church are going after each other with even more than the usual ferocity, it is Augustine's intense commitment to the Church and to the Church's unity that may stand out as most relevant right now. We live in a politically polarized society, and those divisions are powerfully present in the Church as well. It has been said that in American society today, our rival political factions are motivated most by their hatred for each other. And I think it not too much of an exaggeration to say that there is some of that - actually too much of that - even in the Church. Homily on the feast of Saint Augustine of Hippo, Immaculate Conception Church, Knoxville, TN, August 28, 2018. In all its civic solemnity, this week's state funeral will offer a wholesome contrast to the series of scandals that have increasingly enveloped our national capital (and elsewhere). I read somewhere that Senator McCain will be only the 13th U.S. Senator to receive the rare honor of lying in state at the Capitol. I don't know who the other 12 were, but there can be no doubt the honor is eminently fitting in this instance. I never voted for McCain nor would I ever have been tempted to do so, but that only serves as a reminder that we are more than our partisan tribal allegiances, something demonstrated by McCain's congressional career which called both him and others out of their narrow tribal corners, which is one reason he is so genuinely remembered and so widely mourned, one reason too why the two men who defeated McCain for the presidency, George W. Bush and Barak Obama, will be speaking at his funeral. As everyone knows, McCain, the son and grandson of four-star U.S. Navy admirals, lived up to the tradition of patriotic service he had inherited, flying combat missions in Vietnam and eventually being shot down and captured in 1967, and then enduring five and a half years of suffering as a Prisoner of War in North Vietnam. His wartime injuries left him disabled and unable to lift his arms above his shoulders for the rest of his life. Significantly, he later worked to establish diplomatic relations between the U.S. and Vietnam, and made several trips to there promoting reconciliation between the two former enemies. McCain was elected to the House of Representatives in 1982 and the Senate in 1986, where he remained until his death as a member and eventually the Chairman of the Senate Armed Services Committee. While a relatively reliably orthodox Republican on many matters, he also practiced the now almost forgotten art of bi-partisan cooperation. He sought serious immigration reform and, most famously, campaign finance reform. His heroic final legislative legacy was to save Obamacare when his party villainously tried to destroy it. Maybe after all he had gone through, he understood better than many of us do that every day is a gift - to be enjoyed to be sure - but also an opportunity to do something worthwhile. That same experience may also have taught him how some things really are more important - a lot more important - than becoming president. 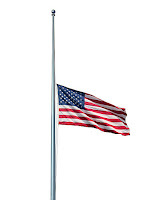 Speaking of presidents, the peculiar dynamics of McCain's funeral will highlight very visibly the contrast between the late Senator and the incumbent President. That contrast is real and significant for sure. Yet that is but one obvious example - a subset, so to speak - of the glaring contemporary contrast between what politics is supposed to be about and what we voters have instead allowed it to become. McCain represented a version of politics that increasingly no longer exists in America. No Platonic Guardian, McCain made mistakes along the way. But he was also able to acknowledge, admit, and correct them. He was, in short, a patriot, in the good sense of that much misused word. McCain appreciated his country and felt honored to serve it. In that, he recalls an earlier era and earlier attitudes, which were once more widely held, attitudes about duty, honor, and integrity. His life was a reminder to a society, that seems to have forgotten, that to be given a position of public trust and honor (whether in government or elsewhere) is itself an honor and a weighty responsibility. Near the end of the 2006 film The Queen, the Prime Minister (Tony Blair) comes to the palace for his regular audience, in the course of which, he reassures Her Majesty that her temporary drop in popularity had been - just that – temporary. To that, the older, wiser, and much more politically experienced Queen replies: “you saw those headlines, and you said, ‘one day that will happen to me.’ And it will, Mr. Blair, suddenly and without warning.” And, of course, by the time the movie was made that was exactly what had happened -probably why that scene was in the film in the first place and why it got the audience reaction it did at the time! Two years later came the PBS mini-series John Adams. In one episode, the not particularly popular President Adams goes to the theater and unexpectedly receives a rapturous ovation. Unimpressed, Adams, who realizes how temporary and short-lived such a sudden burst of popularity probably will be, says to one of his associates: "A mob is still a mob, even if it's on your side"
What Adams and the Queen understood is that popularity is ephemeral. Obviously, an important lesson for anyone who wants or depends on having a popular following! Jesus also attracted a popular following in his time. Backtracking through 5 weeks of Sunday Gospel accounts to the story of the miraculous feeding of the 5000, we will remember how the delighted crowd responded by attempting to acclaim Jesus as their king – certainly a good barometer of Jesus’ popularity, thanks to his demonstrated prowess as a miracle worker. Since then, however, just like a modern news audience tracking a candidate’s declining poll numbers, we have watched the steady drop in Jesus’ popularity, as he proceeded to tell his audience things they really did not want to hear. That, of course, is the danger any public figure faces! That's the age-old difference between a serious leader, who tells people what they need to hear, and a populist demagogue, who tells them what he thinks will keep them on his side! In Jesus’ case, the cheering stopped as it became apparent to people that the miraculous feeding of the 5000 was not just an entertaining interruption in life’s regular routine, much less a ticket to a lifetime of free food, but rather a challenge to reorient their lives in relation to a more permanent reality. Strong language to be sure – a bit too strong for his hearers’ tastes! The Gospel account allows us to listen in on this drama of division and discord which Jesus’ tough talk has caused – as a result of which many of his disciples returned to their former way of life and no longer accompanied him. Centuries earlier, something similar had transpired when the Israelites had gathered with Joshua at Shechem [Joshua 24:1-2a, 15-17, 18b]. Challenged by Joshua, the people answered, reflecting on what they had learned about God through their own experience as a people - how he had brought them up out of slavery, how he had performed great miracles, and how he had protected them along their entire journey. What was anticipated in Israel’s experience was finally fulfilled in Jesus, who is God’s personal experience of human existence. If we want to encounter God and find life for our world, then we must recognize the human ways in which God has chosen to encounter us – as Joshua challenged the people to recognize in their historical experience, as Paul challenged the Ephesians to recognize even in their domestic family life [Ephesians 5:21-32], as Jesus challenged the 12 to recognize in himself. Is Jesus just one option among many? Or have we too come to believe and be convinced that he is the one and only one to go to, and that remaining connected to him is essential? Just as Peter had to answer the question whether and why to stay or to leave, so too must we – today and every day. It is always easy to find reasons to leave, and in the present-day Church there are certainly plenty such reasons. These include exploitative and predatory sexual behavior by those in positions of trust, flagrant and repeated abuses of power, self-serving secrecy, and an inflated sense of entitlement insulated from any accountability. Certainly the past and present moral failures, and failures of leadership within the Church on the part of those of us who publicly represent the Church scandalously disfigure the Body of Christ and obscure the words of eternal life that are intended to be the Church’s message. Such scandals certainly suggest understandable reasons for someone to re-evaluate one’s relationship to the Church. And yet, like Peter, I know of no hope – either for me or for the world – without and apart from Jesus, without and apart from remaining personally and permanently connected to the community of Jesus’ followers. So the question becomes more challenging than ever: what does it mean, here and now, to stay? Homily for the 21st Sunday in Ordinary Time, Immaculate Conception Church, Knoxville, TN, August 26, 2018. It has been decades since I last read Book 8 of Plato's Republic, wherein Socrates describes the deterioration of the ideal society (and in individual terms the corresponding degeneration of the character of the philosopher). Of course, Plato's analysis was primarily philosophical and psychological and only incidentally historical. The chronological sequence of the inherently inevitable decline of states from the best to the worst, from aristocracy through democracy to tyranny, is obviously more an explanatory device than a rigidly precise historical formula. Still there was a certain historically recognizable logic to the sequence, as subsequent students of the subject could see. And so it was to arrest this seemingly inexorable process that the theory of the "mixed" constitution came to be articulated - from its ancient theorists Aristotle and Polybius to the modern founders of the American constitutional experiment. Primarily, such theories sought their inspiration less from an external, ideational, philosophical analysis of human character and more from contingent political experience itself, making the best of the actual human situation, restructuring it institutionally. What Aristotle had theorized, Polybius recognized in the institutional constraints (what we Americans would come to call "checks and balances") of the Roman Republic. The 18th century American founding followed this tradition, and James Madison in The Federalist explicitly invoked both Polybius and the image of the "mixed" constitution. But while the "mixed" constitution could certainly slow down the process of decline into tyranny, it still presumed something from its citizens - certainly not the philosophical detachment of Platonic guardians, but a certain sort of commitment to participate in the process and engage with one's fellow citizens within the parameters proposed by those "mixed" institutions - participation and engagement made possible precisely by trust in those institutions. In the American constitutional settlement (both at its founding and as subsequently amended), the perversion of pubic good by private interest always lurks in the foreground. The public or common good depends for its primacy on the the institutional restraints on populist democracy incarnated in constitutional government - made possible by citizens' inevitably imperfect but still sufficient trust in a shared community. It is arguable that such trust in a commonly shared community may have reached its height in the collective experience of the World War II "Greatest Generation," and that the last 50 or so years have been characterized by its definitive decline. Perhaps the tipping point may have been the disastrous election of 1980, when citizenship seemed increasingly superseded by consumerism. In any case, our country's current crisis, with its suggestion of democratic devolution into increasingly unchecked and unbalanced tyranny, has been years, decades, in the making. No sooner have we heard the Book of Proverbs tell us come, eat of my food and drink of the wine I have mixed, than we hear Saint Paul warning the Ephesians, do not get drunk on wine! The Book of Proverbs is an ancient Israelite compilation of wisdom sayings, some of which were once widely familiar, for example, Proverbs 13:1 A wise son loves correction. but the senseless one heeds no rebuke - or 16:9 In his mind a man plans his course but the Lord directs his steps. Sadly the wisdom of human experience is no longer typically transmitted in that way. Whatever wisdom people learn nowadays, our modern attitudes are much less impressed with the wisdom inherent in inherited experience. Proverbs and the other four biblical books we commonly call “wisdom literature” are very different from the rest of scripture. At the beginning of the biblical story, God was very much front and center – personally creating the world, personally revealing himself to Abraham and his descendants, personally liberating Israel from Egypt, and personally leading Israel into the promised land, where he remained accessible through observance of his law and worship at his Temple and then through oracles and prophets appointed to speak on God’s behalf. Proverbs and the other “wisdom books” are different. God’s word is filtered, so to speak, through the lessons of common human experience. And that is their enduring appeal – so much so that the famous 20th-century American monk Thomas Merton proposed in 1949 that the test of a religious rule might be how “it reflects the calm and the measure” of the biblical wisdom books” [August 8, 1949]. Inspired obviously by today’s Gospel account continuing the story of Jesus’ invitation to enter into eternal life in the Eucharistic banquet, today’s passage from Proverbs invites any and all – everyone in the city, that is, all of society – to partake of the banquet of divine wisdom revealing itself in our experience, enabling us to forsake foolishness and so live and advance in the way of understanding. Watching how to live, not foolishly but wisely, was likewise Saint Paul’s preoccupation, because as he reminded the Ephesians the days are evil. So we must be filled with the Spirit to detoxify our hearts from the un-wisdom that so surrounds us. For, not unlike the Roman world in Paul’s time, today’s world can easily seem to be totally unmoored from any kind of wisdom – not just the political world or the economic world or the social world but even (and especially) the life of the Church, whose failings we have seen exposed again and again with no solution in sight. Certainly we need wisdom – lest, as Saint Paul warns, we continue in ignorance. We need to free ourselves from the frenzy all around us, from the toxicity of our political, religious, and cultural conflicts. We need to free ourselves from the defensiveness that makes everything worse, whether in politics or society or in the Church, where our temptation to defensiveness may be especially strong. Homily for the 20th Sunday in Ordinary Time, Immaculate Conception Church, Knoxville, TN, August 19, 2018. In Mother of God: A History of the Virgin Mary (Yale U. Pr., 2009) Miri Rubin writes of the medieval celebration of the Assumption: "Everything about the feast was designed to remind participants that Mary was seated alongside her son in heaven. The Assumption set Mary apart from other saints and reassured those who sought her intercession and help as she sat alongside her son there. ... All the senses were touched by the Assumption. ... European devotion had never spoken of Mary as elaborately before. Written for an occasion when heaven and earth met, it was fitting that sermons for the Assumption used ornate language, full of pomp. ...The Assumption celebrated the enduring hope of heavenly intercession, the hope that linked heaven and earth" (pp. 139-140). Sandwiched into the middle of the post-modern work week, filled as it already is with frenzy, fury, and folly, the Church's great annual summer "feel-good" festival of Mary's Assumption - the oldest and most important of all of her feasts - may perhaps pass almost or entirely unnoticed. While this neglect in no way diminished Mary's heavenly glory, it does diminish - and deprive us of - the joy we ought to derive from it. Christ's faithful, through the teaching and the leadership of their pastors, have learned from the sacred books that the Virgin Mary, throughout the course of her earthly pilgrimage, led a life troubled by cares, hardships, and sorrows, and that, moreover, what the holy old man Simeon had foretold actually came to pass, that is, that a terribly sharp sword pierced her heart as she stood under the cross of her divine Son, our Redeemer. In the same way, it was not difficult for them to admit that the great Mother of God, like her only begotten Son, had actually passed from this life. But this in no way prevented them from believing and from professing openly that her sacred body had never been subject to the corruption of the tomb, and that the august tabernacle of the Divine Word had never been reduced to dust and ashes. [Munificentissimus Deus, 14]. Homily for the Solemnity of the Assumption of the Blessed Virgin Mary, Immaculate Conception Church, Knoxville, TN, August 15, 2018. There are times in many people’s lives when nothing at all seems to go right, despite all our best efforts. We try our best, but it just isn’t good enough. Too much is being demanded of us; too much seems to be expected of us. We get worn out and want to give up – just like Elijah in today’s 1st reading [1 Kings 19:4-8]. 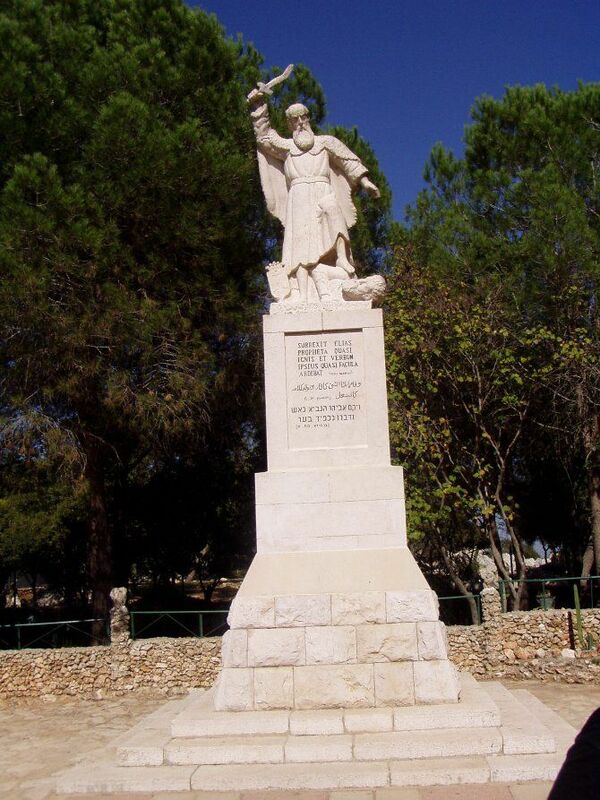 Elijah was – and is - the most remembered prophet of the Old Testament. The familiar Transfiguration story suggests that Elijah in some sense personified the prophetic part of Israel's history (as Moses personified the Torah). Although not the author of any particular prophetic book, Elijah was a powerful prophetic personality at a critical time in Israel's history. He appeared on the scene, virtually without introduction, in the Northern Kingdom during the disastrous reign of King Ahab in the 9th century BC. His story is told in a series of incidents beginning in the first book of Kings. It is a story of faith versus the political corruption of religion by politics that remains radically relevant in every era - and especially our own. 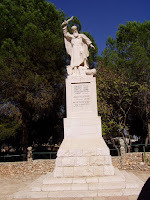 Elijah's battle against the pagan Queen and her false god had put him in direct conflict with the King, who called him troubler of Israel [1 Kings 18:17] - comparable in today's terminology to calling him an "enemy of the people" or a spreader of "fake news.” Elijah's mission included incidents of great success but also experiences of seeming defeat and the discouragement that accompanies constant conflict with popular worldly power. So when Jesus himself at one point expressed his own frustration at having been rejected [Luke 4:24-27] he referred back to the example of Elijah. Most of us don’t lead such significant public lives like Elijah’s, of course. So our own dramas of frustration and failure seldom seem so dramatic. Occasionally, the feelings of otherwise ordinary un-public people sometimes spill out in public - even erupting in violent acts such as we have so often witnessed in our country in recent years. At the other extreme, some try, with greater or lesser degree of success, to keep such feelings behind a defensive wall, in an attempt to insulate both themselves and society from their effects. In between these extremes, feelings of frustration and failure frequently spill out in bitterness, fury, anger, shouting, and reviling – malicious behaviors, which Saint Paul said grieve the Holy Spirit of God. Ready to give up, Elijah fell asleep under a broom tree. But God would not let Elijah’s rejection and discouragement be the end of the story. Awakened by an angel, he found the nourishment he needed and which he would not normally have expected to find there in the desert. He should have recognized that as a sign that help was actually on the way. So depressed was he, however, that even after eating and drinking, he fell asleep again - only to be wakened and fed again. Elijah was ready to give up even on God, but apparently God was not willing to give up on Elijah. God really did demand a lot from Elijah. Hence God’s unwillingness to let him give up, but hence also his readiness to accompany Elijah on the way, personally providing him with what he would need. None of us is Elijah, of course. Yet God does expect results from each one of us as well. And we too may feel at times as if too much is being expected of us. After all, who can really be expected to be kind, compassionate, and forgiving – especially when doing so seems to produce so few - if any – good results? Yet what the great 4th-century Doctor of the Church Saint Gregory Nazianzen [329-390] said of the priesthood applies universally, certainly to anyone who presumes to speak as God’s prophet: We must begin by purifying ourselves before purifying others; we must be instructed to be able to instruct, become light to illuminate, draw close to God to bring him close to others, be sanctified to sanctify... [cf. CCC 1589]. As we have been hearing in the Sunday Gospel readings these late summer weeks, the Eucharist is the visible food Christ gives us for the journey – our life-long journey out of the desert of bitterness, fury, anger, shouting, and reviling to the mountain where, having experienced for ourselves God’s kindness, compassion, and forgiveness, we can at least begin to become people of kindness, compassion, and forgiveness for the life of the world. Homily for the 19th Sunday in Ordinary Time, Immaculate Conception Church, Knoxville, TN, August 12, 2018. 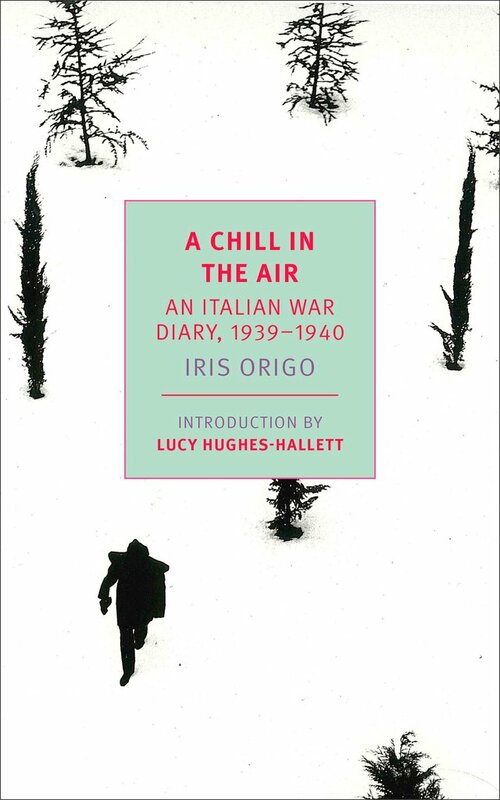 Iris Origo, A Chill in the Air: An Italian War Diary, 1939-1940, with an Introduction by Lucy Hughes-Hallett, and an Afterword by Katia Lysy. On June 10, 1940, the Italian Duce, Benito Mussolini, announced Italy’s declaration of war against Britain and France. That day, FDR famously commented, “the hand that held the dagger has struck it into the back of its neighbor.” That same day, at her estate at La Foce in Italy, Iris Origo listening on the radio, heard Britain’s Duff Cooper speak of “a nation led to destruction by a single bad man and France’s Paul Reynaud’s lament, “Le monde, qui nous regarde, jugera” (“The world, which watches us, will judge”). Meanwhile her husband Antonio and others confined their comments to “ci siamo” (“there we are,” i.e., "that's it"). Iris Origo (1902-1988) was a British-born writer, married to an Italian nobleman, Antonio Origo, who devoted much of her life to their Tuscan estate La Foce. In 1947, she published Val d'Orcia: An Italian War Diary, 1943-1944, which made her famous. An earlier "war diary," covering the period leading up to Italy's ill-fated entry into the war as Germany's ally, was only recently published in 2017. Exceptionally well connected (including among her friends the U.S. Ambassador, who happened to be her godfather) she recorded in her diary gossip of the highest quality, as well as public news (in the golden age of radio), and her own varied observations. Her account confirms what is now conventional wisdom that the once seemingly promising (to Italians and non-Italians alike, among them for a while Churchill) Fascist regime foolishly - and fatally - gambled its and Italy's future on an unpopular alliance with Germany. On March 28, 1939, she wrote "there is another chill in the air: the universal distaste for Germany as an ally. The part of the speech received with the least applause is that which reaffirms the solidity of the Axis." Unlike Hitler's position of virtually absolute power in Germany, Mussolini always governed with certain potential checks on his power. It is widely recognized that the Italian military owed its loyalty primarily to the Crown not to Mussolini. As the latter's popularity declined, due to the German alliance, the King's freedom of movement increased. (That was what finally happened in July 1943 when the King removed Mussolini from office and the whole Fascist edifice came tottering down.) So, for example, on March 31, 1939, she records an officer recently returned from Ethiopia saying "that the army is intensely anti-German. The King anti-war. If there should be a division of opinion on the subject between the King and Mussolini, the army would follow the King." It was, of course, Italy's tragic fact that, after four decades on the Italian throne, the little old King proved so inept at seizing the available opportunity sooner than he did. Origo's attitude toward Mussolini himself is suggestive regarding his personal and his regime's weakness.. On May 14, 1939, she wrote "Mussolini does not want war. He has never wanted a real war - only, at home the 'heroic' state of mind which its imminence produces (and which he achieved by such minor campaigns as Abyssinia and Spain) and abroad, the achievement of his expansionist aims. He does not want war now because he believes that he can achieve these aims without it." The Duce's actual behavior - staying out until the fall of France, then joining when he erroneously thought it was all over but the peace conference - confirmed her insight. It has often been noted how, having nobly declared war in alliance with Poland, Britain and France then proceeded to do next to nothing for months. As a British national, Origo was acutely conscious of and sensitive to Britain's poor image and diminished respect. On April 16 1940, she quoted one woman's lament: "Will England never arrive in time and save a small country before talking about it." She also records some interesting observations about the role of religion. Besides the Crown and the military, another potential check on Mussolini's aspirations to absolute power was the Church. Origo had lots of friends in Italian aristocratic circles. Writing on July 30, 1939, about one pro- Fascist family that was nonetheless part of the old "Black Nobility," she seemed convinced that "where there is a clash between the two [Fascism and Catholicism] Catholicism wins." On the other hand, literally on the very eve of Italy's entry into the war, she wrote that most Italian Catholics "have been content to accept the fact that, in actual practice, it has been easier in the last twenty years than in the fifty years of intense anti-clericalism after 1870, to bring up their children in a Catholic atmosphere at home. They are prepared to yield in principle, where they can gain in practice. And it is this same fluid adaptability ... that has rendered possible the German alliance." Perhaps of most immediate interest in today's context are are observations about how people grew increasingly cynical and distrustful of all news - and this long before the corrupting influences of contemporary social media! Indeed, more than the recounting of comments of prominent people, it is her observations of a society on the verge of self-induced collapse that makes her Diary so well worth reading. She recalls an experience not that long ago or far away. She evokes a mood, a mood that was contagious, and illustrates why it could so easily become so. I first learned about the greenhouse effect as an unsuspecting undergrad at New York's City College. That was in the early days of the environmental movement. (I attended the first-ever Earth Day Central Park in 1970 while an undergraduate.) It was a time when we were all increasing in awareness of a multitude of environmental threats, of which, I suppose, I saw the global warming due to the greenhouse effect as just one more of them. It was also a time when the expectation was that we would somehow get a handle on these problems and solve them. (Nixon established the EPA that same year 1970). To the extent that I thought about those issues in grad school, not much changed in the way I continued to think about them - and expect that they would somehow be solved by a combination of political action and scientific and technical inventiveness. I do remember one professor in an International Law seminar saying that what was really so worrisome about this issue was how the people who knew the most about it (i.e.., scientists) seemed to be the most concerned! The story Rich recounts is, as I said, fascinating - and infinitely saddening. For there was a time - not really all that long ago, in living memory of many of us alive today - when the crisis we are now experiencing as Climate Change was already sufficiently well understood and when the world's major powers were closer than they have ever since been to adopting a global framework for addressing its causes. "After the election, Reagan considered plans to close the Energy Department, increase coal production on federal land and deregulate surface coal mining. Once in office, he appointed James Watt, the president of a legal firm that fought to open public lands to mining and drilling, to run the Interior Department. 'We’re deliriously happy,' the president of the National Coal Association was reported to have said. Reagan preserved the E.P.A. but named as its administrator Anne Gorsuch, an anti-regulation zealot who proceeded to cut the agency’s staff and budget by about a quarter. In the midst of this carnage, the Council on Environmental Quality submitted a report to the White House warning that fossil fuels could “permanently and disastrously” alter Earth’s atmosphere, leading to “a warming of the Earth, possibly with very serious effects.” Reagan did not act on the council’s advice. Instead, his administration considered eliminating the council." Watt and Gorsuch! Recognize those nasty names? "By the end of 1982, multiple congressional committees were investigating Anne Gorsuch for her indifference to enforcing the cleanup of Superfund sites, and the House voted to hold her in contempt of Congress; Republicans in Congress turned on James Watt after he eliminated thousands of acres of land from consideration for wilderness designation. Each cabinet member would resign within a year." As I said above, this is one article that everyone needs to read. It is fascinating, but ever so saddening, as we realize how close we almost came to addressing this problem that is now breathing down upon us - its hot breath quite literally doing so around the world right now. Even were our dysfunctional political leadership to undertake now at this late date to address the crisis, there is already irreversible damage that has been done to our world. Dare we still hope in the human future? In his 1993 encyclical Veritatis Splendor, Pope John Paul II famously included slavery among "the acts which, in the Church's moral tradition, have been termed "intrinsically evil" (intrinsece malum): they are such always and per se, in other words, on account of their very object, and quite apart from the ulterior intentions of the one acting and the circumstances" (VS 81). Referencing the obvious fact that slavery had widely been accepted as just part of the way things were for most of human history, John Noonan, in A Church Than Can and Cannot Change (2005), described the Pope as having "discovered" the intrinsic evil of slavery. Sarcasm aside, Noonan was trying to come to terms and deal directly with the clearly complicated question of doctrinal development, when something like slavery, once widely seen as normal, has become certainly sinful, and when something like charging interest, once certainly seen as sinful, has become not so. Such questions will undoubtedly appear again in connection with Pope Francis' apparently definitive proscription of capital punishment. Actually, that doctrinal development has been in process for several decades now. The Catechism of the Council of Trent, promulgated by Pope Saint Pius V in 1566, clearly recognized the State's power to execute criminals, a teaching the "general and abiding validity" of which Pope Pius XII affirmed as recently as 1955. The 1983 Catechism of the Catholic Church (paragraph 2267), however, expressed a much more nuanced view of the legitimacy of capital punishment, affirming it in theory but then in practice somewhat limiting what had been affirmed. In his 1995 encyclical Evangelium Vitae, Pope John Paul II went further, stating that the cases in which the execution of the offender is an absolute necessity "are very rare, if not practically nonexistent," and the Catechism's text was subsequently amended to reflect that added nuance. This felicitous formulation avoids "intrinsic evil" language and the problems inevitably associated with that approach. It thus also avoids the popular contemporary tendency to pass ex post facto judgments on previous generations. It acknowledges that the death penalty used to be considered "appropriate" and "acceptable" but now no longer will be - because of "an increasing awareness" and "a new understanding." The long-term effect of thus incorporating concepts like "an increasing awareness" and "a new understanding" into the Church's moral pronouncements at such a high level remains to be seen, but seems likely to be significant. As with slavery, this doctrinal development follows and aligns with an already changed secular outlook in most Western societies. Here, however, the U.S. remains something of an exception. It will be most likely in the U.S., if anywhere, that there may be some strong expressions of dissent from the Pope's pronouncement, perhaps especially in those circles that have sought in recent decades to realign Catholicism with the ideology of one particular political party. That strange alliance may in turn help maintain the US in its outlier position versus the rest of the world on the question of capital punishment, while in the process unfortunately continuing to diminish the Church's already fragile moral voice and standing in the US. In contrast, Pope Francis, who has already undertaken to reinvigorate the Church's moral voice and standing in the wider world by confronting this century's challenge of climate change and "caring for our common home" (an effort nobly begun by his predecessor, Pope Benedict), has taken yet another powerful step in that direction with this latest challenge to American exceptionalism. I am not a musician. So I am not a regular reader of the blog, Views from the Choir Loft. I did, however, recently encounter this interesting post called "Remarkable Quote About Low Mass" - http://www.ccwatershed.org/blog/2018/jul/27/remarkable-quote-about-low-mass/. DURING A LOW MASS, THERE IS USUALLY TIME for four hymns—one from the beginning of Mass up to or through the Gospel, but certainly to be finished by or before the end of the Gospel Reading, so as not to interfere with or delay the making of announcements or the preaching of the sermon. A second hymn can be started at the Credo; another after the Elevation, and the last one during Communion, to end with the last Gospel for the prayers after Mass. The author's reaction? "Yikes! A Mass offered like this must have taken no more than 25 minutes. And how inappropriate to say it's okay to 'sing over" the entire Mass... just don't delay the announcements!" He concludes, "it's sad to know that Mass was offered like this in some places." Now what I found interesting about this is not that Mass was offered that way in some places, but that anyone interested in liturgy didn't know that and/or is surprised by that. It seems to me that those who appreciate what they think of as traditional liturgy should also be aware of what ordinary people's actual experience of that liturgy was - not the refined and rarefied beauty of dignified and solemnly sung celebrations of the pre-conciliar rite but what most people typically actually experienced at that time. While the solemnly sung liturgy was theoretically the norm, Low Mass was the normal reality most American Catholics experienced in the first two-thirds of the 20th century. If a Low Mass had no sermon and few or no Communions, it could easily be over in 20 minutes. Sunday Mass - with a sermon and Communion administered by extra priests starting right after the Consecration and finished more or less by the time of the priest's Communion - would take a little longer. Growing up, I seldom experienced hymn-singing during Mass, that being particularly popular in certain parts of the country and among certain ethnic congregations. But since such hymns were simply sung over the actual mass parts, they did not add to the length of the Mass. And, rather than detracting from the celebration, my guess is that they were widely seen as enhancing its dignity and solemnity. My point is not to celebrate or criticize such pre-conciliar practices, which had their own context and were perhaps no more or less conducive to sanctity than those of any other time or place. Personally, I loved the old sung liturgy and often attended the Sunday High Mass.. But, again, although every parish was supposed to have a Solemn Mass or at least a Missa Cantata every Sunday, it think it safe to say that the most widespread experience for most American Catholics at that time was a Low Mass of a length like the one referenced in that 1937 article. Understanding what it was actually like may help one to understand why the liturgical movement arose in the first place! That is not to say that what actually happened in the post-conciliar liturgy fulfilled the original goals of the liturgical movement - or even the expectations of those who voted for Sacrosanctum Concilium. Those are all legitimate questions to consider, of course, but are not my concern here. My concern here is simply that what passes for "traditional" liturgy nowadays is in its own way really something new and itself a consequence of the liturgical movement. In any case it is more than likely much more dignified and solemnly celebrated than anything those earlier generations typically experienced or ever expected..